You know when you're hungry and you get a muffin at the coffee shop, because you're looking for something sweet like a cookie but more "umpf" than a donut and when you eat the muffin you find yourself deeply unfulfilled because that muffin was sweeter than expected or it just had no substance to it at all? And I have the solution. 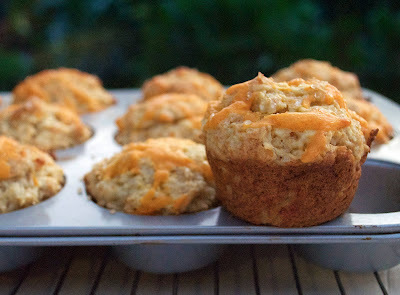 An apple cheddar muffin. This is the muffin that is going to satisfy that sweet and savoury craving your having. It's gonna satisfy that "I wanna meal but don't actually need a meal" craving. Unfortunately they are kind of addictive, so you may end up eating a meal of muffins. But let's solve one problem at a time fellas! Preheat the oven to 350 degrees F. Grease or line muffins pans with paper liners. In a large bowl cream butter and sugar together. Once mixed add eggs, one at at time. Mix in grated apples. Combine the flour mixture into the large bowl and mix until just combined. Divide batter among muffin cups, you may have left over batter, this is when you take the opportunity to eat the extra batter... or make one big muffin! Sprinkle the rest of the cheddar cheese (1/4 cup) over the muffin tops and generously sprinkle turbinado sugar over each muffin. Bake for 20-25 minutes ( I did 22 minutes in my oven) or when a toothpick inserted into the center of the muffin comes out clean. Let cool in pan for 10 minutes then transfer muffins to cooling rack. Yum these sound so delicious! I like the combination of apple and cheddar. They're so good! I highly recommend you try them, they don't last a day in my house!